We think we know the story of Odysseus, whose journey home following the battle of Troy took him ten long years, but we do not. 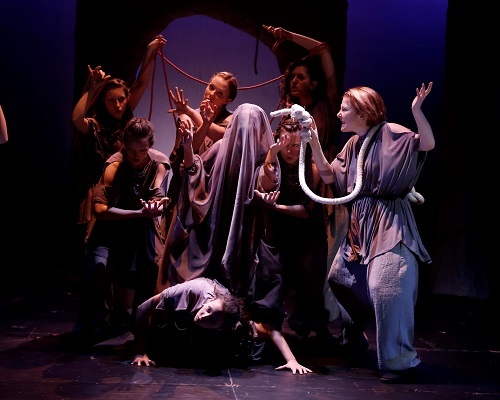 George Brown Theatre’s production of Margaret Atwood’s play The Penelopiad–an adaptation of Homer’s Odyssey from the perspective of Penelope, Odysseus’s faithful wife–embraced the feminism and lyricism of this retelling of a truly timeless story. Odysseus is a legendary hero of the Trojan War, which was fought over Penelope’s magnificent and vain cousin Helen. Shortly after their marriage, Odysseus left to fight in the decade-long war; he is then “trapped” at sea for another ten years on the return home, leaving Penelope to fend for herself and their son against a band of loutish suitors who have presumed Odysseus dead. Penelope enlists the help of her twelve most beloved and loyal handmaidens to outwit the suitors–but nobody in this tale is rewarded for their loyalty. While the writing is modern, the play retains elements of a classical Greek play through the use of a chorus. Members of the all-female company were maids and other characters as needed. The play involves a number of musical choruses, which the company wrote themselves. The melodies they composed were simple and reminiscent of children’s songs. The music was well suited to the youthful voices of the cast, and elegantly captured the naiveté and helplessness of the maids. The production featured a lot of emerging talent to watch out for. Kyrah Harder was regal, vulnerable, shrewd and passionate in the title role. Penelope is a very weighty role for a young performer to undertake and Ms. Harder acquitted herself superbly. Male characters were performed as pants roles and Gabriella Albino was clearly in her element as the cunning and bold Odysseus. Her characterization was masculine without being affected and clearly expressed the complexities of a man pulled in many directions. Caroline Bell provides some much needed comedic relief to this play in the role of coquettish Helen. Bell’s connection to Helen’s delight in her own radiance was palpable. This woman clearly enjoyed starting a war that killed throngs of adoring fans. The costume and set design innovated within simplicity. Cast members were dressed in draped Greek attire with Penelope being the only performer in soft colours. The remainder of the cast wore sombre neutral tones. Similar colour contrast were repeated in the set and prop design, most notably through the use of red rope snaking around the Grecian archways that were repositioned to create different scenes. The symbolism of rope and ensnaring was used at pivotal moments throughout the performance in a manner that was rich with visceral meaning. I love this play and was pleased to have the chance to see it again, this time performed by up and coming talent, rather than veterans of the caliber of Megan Follows. George Brown Theatre did a superb job of filling sizeable boots in this bold undertaking. Definitely worth seeing while it’s on. Ticket prices are $8 for students, $15 for Seniors and George Brown staff and alumin, $20 for general audiences.